We will be using these stickers on our Christmas cards. They are simple yet beautiful for the cards. Have been purchasing these for years. I have been your loyal customer since 1984 when I first own a house in Lathrop, CA. then to Hayward, CA. and now here in Union City, CA. 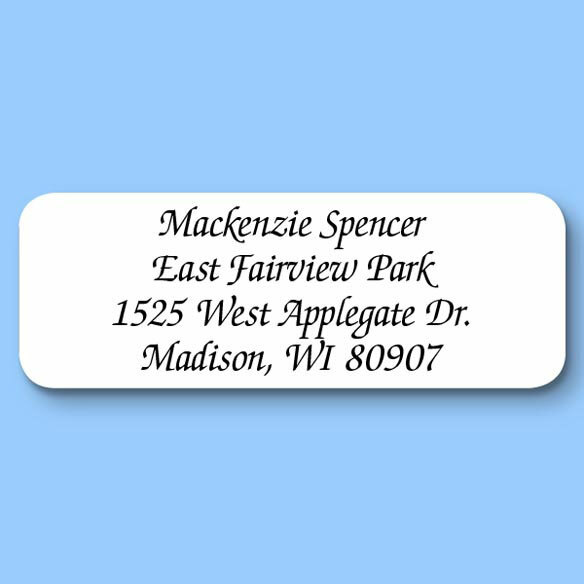 Compared to other Address Label Brands, to me, yours is the best. Thank you. Simple yet elegant. Just what we wanted for our personal use. Quality of the stickers was much better than I expected for the price. Will be ordering the clear ones soon. Great address labels. Very clear and just what I needed! Disappointed for the first time! The print was too light and too small on these gold return address labels. I contacted customer service via e-mail to ask about a replacement and the response given was that there was no refund or return on personalized items. I will be calling tomorrow; some adjustment is warranted in this case. Print too small and ink is TOO light! I just received my new labels today and sadly they will either be returned or dumped in garbage, the print is SO SMALL and the ink is SO LIGHT, the labels are hard to read and not acceptable. Very disappointed!